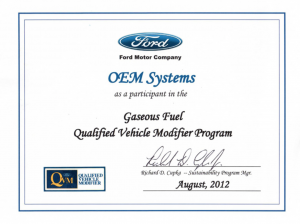 In August of 2012, OEM Systems earned Ford Motor Company’s certification as a participant in the Gaseous Fuel Qualified Vehicle Modifier (QVM) program. OEM Systems and our QVM certified kit manufacturers have been successfully evaluated by Ford Motor Company on criteria such as engineering, the manufacturing process, quality control, and adherence to Ford guidelines. More specifically OEM has met compliance with Federal Motor Vehicle Safety Standards (FMVSS), conformance with Ford industry guidelines for vehicle conversion, facility inspection and review, and a commitment to continuous improvement. Because of the Ford QVM program assists CNG installers like OEM Systems in developing a high-quality conversion process, the customer can feel confident that the finished product will meet or exceed their expectations. While Ford does not produce the final product, QVM conversions are specifically designed with Ford requirements to meet the unique demands of the industry. 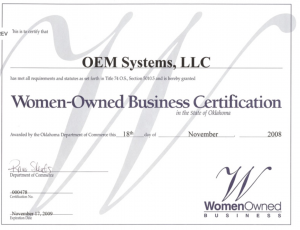 OEM Systems is certified by the Oklahoma Department of Commerce as a Woman-Owned Business and certified Small Business by the Small Business Administration (SBA) standards. OEM is a MVP Member of the National Truck Equipment Association (NTEA). Attaining membership and certification from the NTEA organization shows our commitment to the quality of work our industry demands and your business deserves. OEM is a participating member of NGVAmerica, Association of Central Oklahoma Governments (ACOG), and the Greater Oklahoma City Chamber of Commerce. In addition, our company maintains on-site staff members that maintain certifications and specialize in areas such as Alternative Fuel, automotive cranes, automotive paint, engineering etc. Want the job done right, the first time? Contact us.